Welcome to the magic shop of Mr.Cummagen. This is a best place where you can buy all the invocation ingredients. 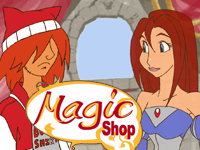 Our hero Joe is working here as an assistant manager and he is strictly prohibited to create his own magic potions. But he wouldn't deny the young beautiful brunette Biannca who asked him to convert her hair to a blonde color. Boring, don't waste your time. How much for the emoji? Ancientstorm yeah, but's demo!!!! And I appreciate the guys working!!!! Why would you want to get the demo guys? Come on!